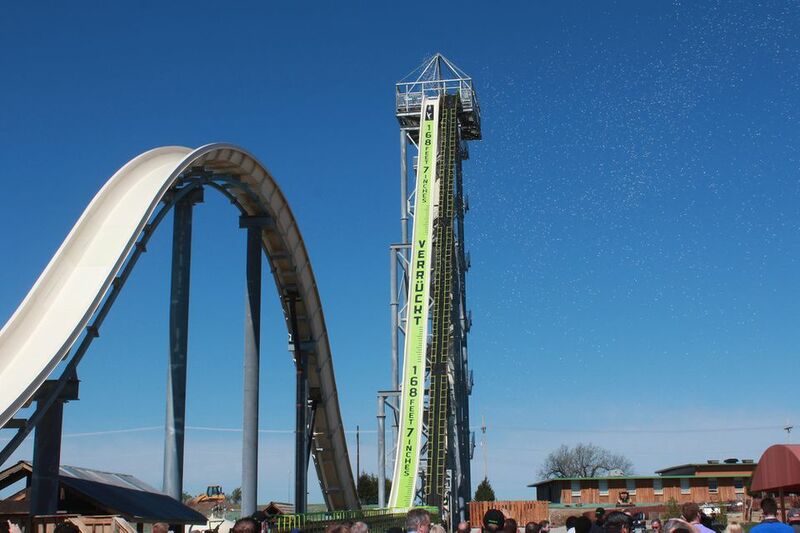 When it opened in 2014 at Schlitterbahn Kansas City, Verruckt was the world's tallest and fastest water slide. It generated a lot of buzz. Unfortunately, a 10-year-old boy died on the prototype ride in 2016, and the tragic accident garnered even more publicity. The park permanently closed Verruckt after the incident and has plans to tear it down. Height requirement to ride: 54"
Water parks aren’t generally known for delivering major thrills. That’s more the province of amusement parks. Sure, water slides can offer fast-paced drops, exciting twists and turns, lights-out rides in enclosed tubes, and other pulse-racing features, but they don't come close to matching the speed, acceleration, G-forces, and thrills of the world’s fastest roller coasters. Even water coasters, which send passengers in rafts racing around coaster-like courses filled with water, usually don’t rev up to speeds much faster than most junior coasters. Speed slides, which, as their name implies, are designed for speed, do offer thrills, but they typically pale in comparison to the adrenaline jolts of behemoth roller coasters. The Henry family, water park pioneers who established the original Schlitterbahn in New Braunfels, Texas and introduced many industry innovations such as the uphill water coaster, broke the mold again with Verrückt. By combining water coaster technology with a very high speed slide, passengers were able to experience major-league thrills at the Kansas City park. The unique ride name, “Verruckt,“ is a German word that means “insane.“ The first Schlitterbahn (which translates into “slippery road“) is located in a heavily German area, and many of the park chain”s attractions and lands bear Germanic names. Even getting to the top of the ride was an adventure. Assuming there was no wait, it took about seven minutes to climb the 264 spiral stairs winding around the attraction’s tower. Riders boarded four-passenger inflatable rafts. When the coast was clear, they were nudged over the edge and soared down the 169-foot hill at a pretty dramatic angle. To put Verruckt in perspective, one of the world’s tallest speed slides (and the previous North American champ) was Summit Plummet at Blizzard Beach. It is 120 feet tall, reaches about 55 mph, and is, in our opinion, the most thrilling ride at Disney World. Schlitterbahn’s speed slide was more than 40% taller and at least 20% faster. Its speed and height nearly matched the specs of a “hypercoaster,” which is loosely defined as a roller coaster that climbs at least 200 feet. See which other rides make the list in a rundown of North America's tallest water slides. Verruckt also incorporated Schlitterbahn’s patented Master Blaster system. When passengers reached the bottom of the speed slide, powerful jets of water added to the momentum of the 169-foot drop and propelled the rafts up a 50-foot camelback hill. To clear the five-story incline, which had never before been attempted on a water coaster, ride designers had to develop new technology. Zooming up the hill, the ride delivered a pop of coaster-like airtime. Riders raced down the other side of the second hill and hit a straightaway before cruising to a halt. After passengers exited the ride, a conveyor belt took the rafts on the long trek back to and up the tower. It’s unclear exactly what occurred to cause the death of the rider, Caleb Schwab. Police described that the boy suffered a fatal neck wound. The Kansas City Star reported that his raft went airborne as he descended the tall hill and he hit the protective netting above the slide. Schwab was riding with two women who suffered face injuries. Schwab’s family received a nearly $20-million settlement. In March of 2018, Schlitterbahn co-owner Jeffrey Henry and ride designer John Schooley were charged with reckless second-degree murder. Also charged was Henry & Sons Construction Co., the company that constructed Verruckt. If found guilty of second-degree murder, the accused could serve 9 years to 41 years in prison. Now that investigators have concluded investigating the structure, there are plans to tear it down. Demolition work is scheduled to begin in September 2018.